70% of the 250 Australia's AIS2 and 74% of Hawaii's AIS3 arrived via biofouling. 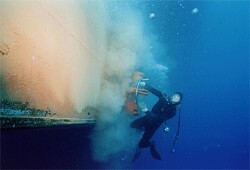 Vessels may contain up to 90 tons of fouling. Simply cleaning the ship is not enough, as live organisms are often released into the water during this process (image at right). Because vessel fouling has only recently been recognized as a significant vector of AIS introduction, research is limited but increasing. For a list of literature, see our AIS Literature page. In addition, visit the Aquatic Bioinvasions Research and Policy Institute's project, Assessing Hull Fouling as a Vector of Invasive Species: A Case Study in the Lower Columbia River. 2 Australian Quarantine and Inspection Service. 2005. AQIS Fact Sheet. 3 Godwin, L Scott (2003). Hull Fouling of Maritime Vessels as a Pathway for Marine Species Invasions to the Hawaiian Islands. Biofouling, 19 (1), 0892-7014.